아트업 인도네시아의 목표는 예술을 통해 창조적인 아이디어를 나눔으로써 순환경제의 의미를 되새기고 지속가능한 소비와 생산(SDG12)이라는 목표를 실천하면서 시민들과 함께 폐자원 문제를 더 깊이 이해하고 고민하는 것입니다. The purpose of the Artup Festival Indonesia is to share creative ideas through art that reflects and symbolizes circular economy, and help people understand the problem of abandoned resources, implementing SDG’s point 12 Responsible Consumption & Production. 이번엔 Greeneration, Lookats Project, Bandung Clean Action이 인도네시아 지역의 재활용품을 소재로 업사이클 아트 공모전을 개최합니다. 반둥의 대학생 아티스트들이 기성 아티스트들과 팀을 이뤄 작품을 만들고, 공공아트 워크숍과 세미나, 부대행사들을 진행하면서 시민들과 함께 인도네시아의 환경 문제를 고민하고 순환경제의 중요성을 알릴 예정입니다. 아트업 인도네시아에 대해 더 알고 싶으시다면 인스타그램에서 @Artupfest.id을 팔로우하세요. 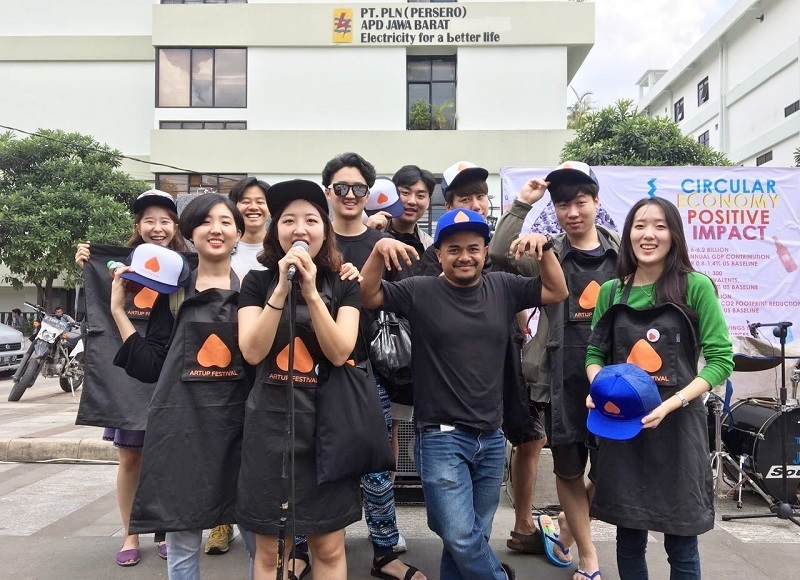 Greeneration Foundation collaborate with Lookats Project and Bandung Clean Action to hold waste-to-art competition between artists from Universities students using waste collected from waste management assets in Bandung, with the guidance from senior artist. We will also hold public interactive workshop, seminar and other performance as a supporting activities to educate people about circular economy as an approach to addressed waste problem in Indonesia. Follow our Instagram : @Artupfest.id to know more about Artup Festival Indonesia. Copyright @ 2016 Weenu.com. All rights reserved.